What is the strangest thing ever found on the set of a TV show? I’m going to go with “a human body”. Yes, a real live (or should I say “dead”?) human corpse. And that’s only part of the strangeness of this tale. In 1977, The Six Million Dollar Man was a hit TV series starring Lee Majors. That year, the show was filming an episode, Carnival of Spies, at Nu-Pike, a museum-park in Long Beach, California. During filming, one of the crew was instructed to move a mannequin. The mannequin was painted fluorescent orange; it was dressed in a cowboy outfit and was hanging from a rope. When the crew member tried to lift it, one of the mannequin’s arms broke off. Horrified, the cast and crew soon discovered that this “mannequin” was actually a human body! The cowboy dummy was later discovered to be a man named Elmer McCurdy (1880-1911). Incredibly, the corpse’s identity was revealed by two items found in McCurdy’s mouth: a 1924 penny and a ticket to the Museum of Crime in Los Angeles. From these two items, the story of the corpse was reconstructed. 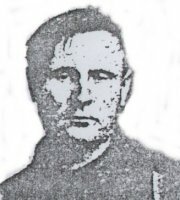 Elmer McCurdy was a small-time criminal who often bragged that his only arrest was for being drunk in Kansas, where he had killed a man in a drunken brawl. After a variety of low-level crimes, McCurdy turned to train robbery. In 1911, he ambushed a train in Oklahoma. He believed the train contained thousands of dollars, but it turned out to be a passenger train… McCurdy got away with $46 and two jugs of whiskey, the latter of which would perhaps play a small role in his decision making process that led to his demise. As law men moved in on a somewhat drunk McCurdy, who had taken refuge on a farm after the robbery, he vowed that they would not take him alive, boarding himself up in a hayshed. McCurdy was right and he was killed in the subsequent shoot-out. His body was taken to a funeral parlor in Oklahoma and no one came forward to claim it. The funeral parlor’s undertaker came up with an ingenious idea- he embalmed the body and charged customers a nickel apiece to see “the bandit who wouldn’t give up”. McCurdy’s body on display proved to be a lucrative racket for the undertaker. A while later, the undertaker was conned by a traveling carnival owner, who claimed to be the brother of McCurdy and wanted the body so he could give it a respectful burial. Reluctantly, the undertaker turned the body over to the man, who immediately put it in his traveling show. Over the years, the body was passed off from business to business and eventually ended up at the Nu-Pike Museum and Park, where it was stored and forgotten until that fateful day in 1977 on the set of The Six Million Dollar Man. You might be wondering at this point why McCurdy had a ticket and a penny in his mouth. Starting all the way back with McCurdy’s time at the undertaker’s establishment, people would place coins in the mouth of McCurdy, for who knows what reason. It’s been speculated that this was simply how they made payment for seeing the body; or perhaps people were doing it for similar reasons as to why we throw coins into fountains; or maybe this was a throwback to the Ancient Greek and Roman practice of putting coins in people’s mouths so they could bribe Charon, or similar such mouth/dead person traditions practiced by many other cultures throughout history. Whatever the case, this practice appears to have continued and at some point the last to do this placed a penny in his mouth and they or someone else also placed a ticket stub to the museum where they were seeing the body at the time, the Sonney Amusement’s Museum of Crime in L.A. It was lucky they included the ticket stub, as this provided the necessary clue needed to track down who the man was. Once the mystery was unraveled, McCurdy’s body was returned to Oklahoma and buried in a cemetery. The state medical examiner ordered two cubic yards of concrete be poured over Elmer McCurdy’s coffin, so his remains would never be bothered again. And so, after 66 years, the body of the luckless man who made far more money dead than he ever did alive, was finally put “at rest”. The article is missing some info. How did the body end up painted orange, in a cowboy outfit, and hanging from a rope?? ?